THE ABCs OF DEATH: An alphabetical arsenal of destruction! This explosive film is comprised of 26 individual chapters on the topic of death, each helmed by a different director assigned to a specific letter of the alphabet. Provocative, funny and shocking, this anthology is the definitive vision of modern horror diversity. 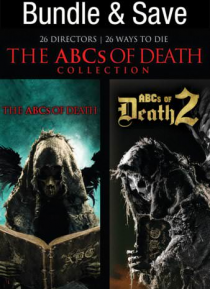 ABCs OF DEATH 2: The follow-up to the most ambitious anthology film ever … conceived. It features 26 segments directed by over two dozen of the world's leading talents in contemporary genre film and is another global celebration of next generation genre filmmaking. Get ready to learn your ABCs!